Part 5 of my introduction to learning bird songs is now up (click here). Many of the words that we use to describe the quality of a bird song also carry information about pitch and tempo. For example, only sounds in a certain pitch range can be described as whistled, and we tend to call lower-pitched whistles “rich” or “full”, and higher-pitched whistles ”thin” or “squeaky”. Similarly, certain descriptive words tell us about the tempo of the song. Words like relaxed and lethargic describe a slow tempo, and a buzz is just like a trill, only faster. Singing Prothonotary Warbler. 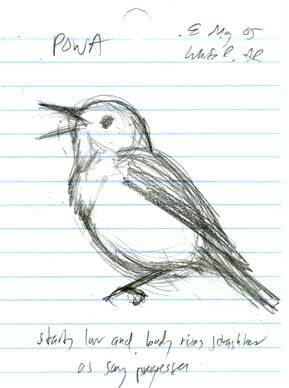 Pencil sketch from the field in Arkansas, May 2005, copyright David Sibley.